Lucille Clifton grew up in a home filled with books and poetry by African American authors. Her father labored in the steel mills while her mother worked as a laundress, and both parents instilled in their children a love of the written word. Clifton entered Howard University at the early age of sixteen. In 1955 she transferred to Fredonia State Teachers College, where she worked as an actor and began to develop the powerful, unadorned style of poetry that became her trademark. Clifton's first volume of work, Good Times, celebrates African American culture and explores themes of resistance, adversity and triumph. Good Times was cited by The New York Times as one of the best books of 1969 and introduced Clifton as a key voice in the Black Arts Movement. In 1970, she ventured into children's literature with the publishing of The Black BC's and Some of the Days of Everett Anderson, the first of eight books featuring a six-year old boy and his mother. Clifton displays her signature simplicity and honesty as the protagonist, Everett Anderson, confronts such subjects as: his heritage in All Of Us Come Across The Water (1973); the remarriage of his mother in Everett Anderson's 1-2-3 (1977); his friendship with a mentally-challenged neighbor in My Friend Jacob (1980); and the death of his father in Everett Anderson's Goodbye (1983). Clifton's writing is steeped in the rich oral tradition of the griot - the African storyteller. Through verse Clifton has scrutinized the American dream through the eyes of its most powerless and neglected citizens: women, minorities and children. In Generations: A Memoir (1976), Clifton traces her roots through the eyes of Caroline Sale Donald, her ancestor stolen from the shores of West Africa and brought to New Orleans, Louisiana as a slave. Poems from Generations, Good Times, Good News about the Earth (1972), An Ordinary Woman (1974), and Two Headed Woman (1980) were reissued in the book Good Woman: Poems and a Memoir 1969-1980 (1987), which was nominated for a Pulitzer Prize. Blessing the Boats: New and Selected Poems 1988-2000 showcases selected poems from Next (1988); Quilting (1991); The Book of Light (1993); and The Terrible Stories (1996). In Blessing the Boats, Clifton examines the subjects of loss and tragedy, both public and private. She touches on the shifting landscape of her childhood, womanhood, and dreams. Many of the poems address violence and brutality with startling frankness, yet still display a cautious hope for redemption. Despite recurring motifs of disillusionment and disappointment, a foundation of optimism and spirituality pervades the spare, simple prose. 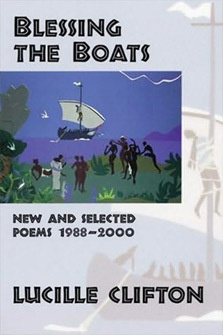 Blessing the Boatswon the 2000 National Book Award for Poetry and was cited by judges as "a work of witness and testament, outcry and affirmation, lament and prayer." Lucille Clifton currently resides in Maryland, where she is a Distinguished Professor of Humanities at St. Mary's College. VIDEO: Lucille Clifton Recites Poem, "Homage To My Hips"